Sunrise this morning was the warmest part of the day at 60°. This afternoon’s dry breezes will cool us down into the upper 40s by sunset, and into the 30s tonight. Tomorrow will see the dry weather continue, with a notable chill in the air. Despite the 1.25” of rain that fell yesterday, the moderate drought continues with more than an 8 inch rainfall deficit for the year, and about a 2 inch deficit since September 1st. Saturday night brings back clouds and some spotty sprinkles, with the clouds lasting into early Sunday morning. By 9am Sunday most of the clouds are gone, and the rest of the day will feature sunshine. The real chill settles in for Monday, with the potential for the city’s first frost by Tuesday morning. Then, a milder trend takes over with mild, sunny weather and near 60° for Thanksgiving and Black Friday. No significant rain is on the 7 day. Despite tonight’s forecast first freeze, the air feels colder this morning, thanks to gusty winds. Wind chills make Monday morning’s weather feels like the mid-20s, with the mid-30s arriving this afternoon. Gusts will blow to 25mph, putting a biting chill in the air all day. As breezes subside tonight, the skies will stay clear, allowing for actual lows to dip to freezing. Milder weather arrives Wednesday with calm breezes. Thursday and Friday will be in the 60s with sunshine. Cooler weather arrives for the weekend. With colder weather comes better chances for snow—weather that’s synonymous with December. The weather should get interesting in the 5-10 day period. The city’s first freeze occurred at 3:53 this morning, when the temp dropped to 32°. Little wind all day keeps the wind chill at bay. Sunshine today and tomorrow helps the afternoons warm to average for Wednesday. Thursday sees clouds return with a high near 60. Friday will be sunny and mild, with light sprinkles for Saturday morning. A more substantial rain moves in on Monday with cold air. This year’s El Niño became the strongest on record yesterday, surpassing the warmth of the great 1997 El Niño. The pattern shift that coincides with the start of December next week, will keep our weather busy going into December. Cloudless skies and seasonably cool and calm weather today is followed by a Thanksgiving that starts sunny in the upper 40s for the Parade, and turns cloudy, but still milder by midday. Fog, clouds, and generally low visibility will impact Friday morning’s rush to the stores. Sunshine and even milder weather returns midday Friday. Highs will be in the mid 60s. Saturday begins cloudy, then turns cooler. Temperatures remain around average (50) for the remainder of the month. December begins a bit more active with the next chance for rain arriving on Tuesday. A much-needed soaker might be down the road into next weekend. Thanks to high pressure over Virginia, we have a southerly flow of cool to mild air that will bring us highs from the low to mid-60s and lows from the upper 40s to the low 50s on this Black Friday. The average high and low for this time of year is 50 and 38 degrees which will be about 14 degrees above average. We also have a cold front that stretches from southeastern Canada to Texas and the four corners region. As a result, we have a slight chance of a few scattered showers Saturday and Sunday. Once the front clears, we’ll begin to feel a cooler and dryer are mass for the start of the new work and school week with highs in the 40s and 50s while lows fall to the 30s and 40s for next week. Rain holds off until later tonight. First, a chilly day starts with a light east breeze. That wind helps clouds thicken into the afternoon, keeping temperatures around average. Light showers begin after 7pm tonight, lingering through tomorrow’s forecast. 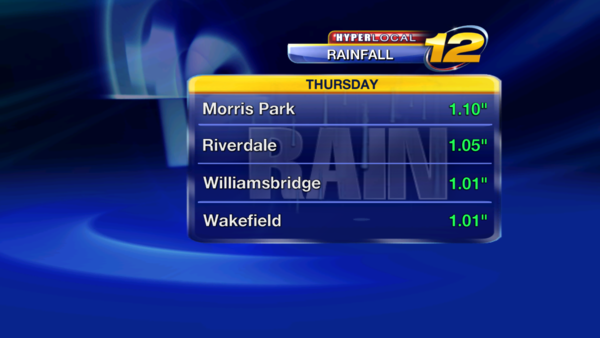 Steadier, more moderate rain begins late tomorrow afternoon, and lasts through Wednesday night. When finished before dawn Thursday, the 2.5 days of rain will total anywhere from 1-2 inches. 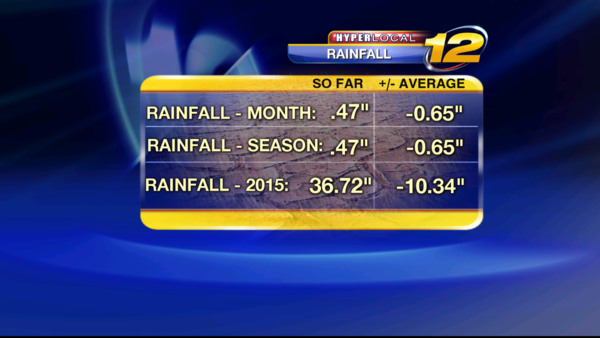 The drought isn’t getting any better, as we’re approaching a 10-inch rainfall deficit for the year. About a week long dry spell begins this Thursday. The Atlantic Hurricane season ends today, with one named storm shy of average (that’s a pretty typical year). The bigger climate story is that November will be the 3rd month in 2015 that was the warmest month on record for the city. August was 3rd warmest. February was 3rd coldest. El Niño will keep the weather wacky through the end of the calendar year. Tomorrow begins climatological winter (Dec 1- Feb 28). Deep Siberian snowpack has made our past two winters snowier than average. Looking at only that parameter, snow depth over Siberia is deeper than average. In the short term, we’re snow-free for the next 10 days. 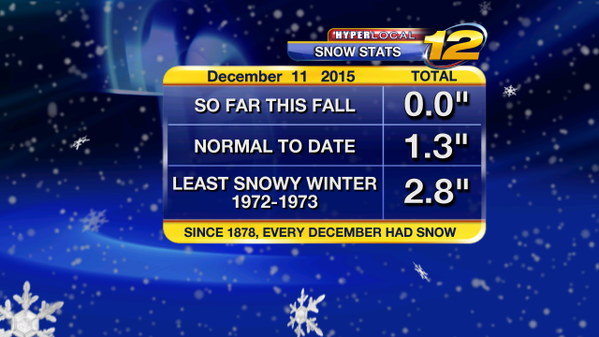 We usually have an average of .3” of snow by now. After the record warmth for November (tied with November 2001 for warmest on record), that isn’t happening anytime soon. This morning’s rain ends tomorrow night, but there’s a lull in the rain tomorrow morning with just clouds, fog and mist for Wednesday morning’s commute. Thursday morning begins sunny and quickly turns windy with a seasonable December chill in the 40s. Wind chills Thursday will feel like the 30s with gusts to 30 mph. Friday and the weekend will be seasonably cool with sunshine, around 50. That sunny weather lasts until Wednesday of next week. Rain returns by next Thursday. The solid 7-day stretch of sunshine is a problem for the ongoing drought: 3.5” less than average rain for Fall. 9.7” less than average rain for the year. (Today’s rain helped us exit the top 10 list of driest years on record…to be in the top 15 is still rather significant). Since our first frost was so late, I don’t see any significant warm-ups in the next two weeks, only better chances for colder air by the middle of December. Not even a half inch of rain fell after the pair of dreary days. The next 10 days will only further deplete the city’s reservoir system, currently at 80% capacity (average level for early December is 82%) After today’s milder than average start at 53°, dry gusty breezes to 25mph will make the afternoon feel cooler despite the afternoon sun bringing us to a 51° midday temp. Winds relax tonight under clear sky, and Friday morning starts cooler, in the 30s. Under mostly sunny skies, highs make a run for 60 degrees on Sunday. Tuesday’s rain threat is diminishing, with the system likely swinging out to sea. That would keep us dry and mild through the middle of December . After two days of rainy weather (about .43”) followed by gusty westerly winds from 25 to 30 mph, nicer weather returns just in time for the weekend. High pressure is currently centered over Illinois and will slowly move east and off the coast by late Sunday early Monday. The high will bring a comfortably cool air mass to the region with highs around the mid-50s and lows around the mid-40s Saturday through Monday. Our next round of much need rain will be Tuesday and Wednesday of next week. Some of the mid-month weather guidance puts record warmth across the Eastern US (including us) by December 14. Two highlights long range: we miss all the moisture as next week’s rain swings out to the Atlantic; the 2nd half of December is forecast to be more active. Enjoy the mild, sunny and calm weather while it lasts! 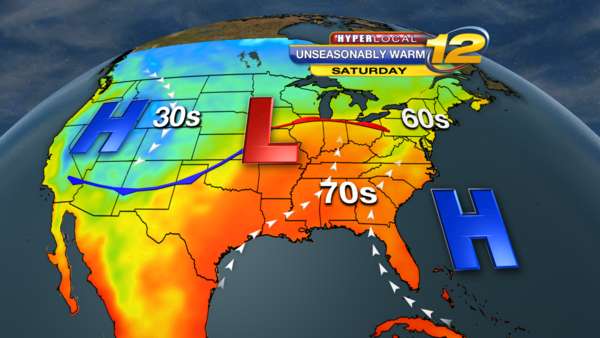 Temperature records are in the 70s this weekend, but I’m sure you’ll enjoy the near 60° warmth on Sunday. Nice weather takes us through the weekend as high pressure moves east across the Ohio River Valley. Clouds will increase be Monday night as low pressure is forecasted to ride up the Mid-Atlantic coast. At this time, it looks like the low will be nudged far enough east so that we have a good chance of remaining dry. I was wrong about this past weekend being so mild, because this upcoming weekend is forecast to be even milder. Highs will likely be in the low 60s by this Saturday and Sunday, a few degrees shy of the records in Central Park, tying or breaking the records at the airports. Until then, the remainder of this workweek will be just above average, in the upper 40s tomorrow and Wednesday thanks to dry northerly winds. Those cooler breezes are aided by a storm system that stays just offshore tonight, bringing in clouds this evening. Highs today should climb into the mid-50s under mostly sunny skies. Pleasant weather continues with high pressure to our west. Developing low pressure off the North Carolina / Virginia coast will bring an increase in clouds tonight and early Tuesday. Clouds and a northerly winds will bring cooler temperatures to the borough through Wednesday. Well above average temperatures return Thursday through Sunday with highs from the mid-50s to the mid-60s under a mix of sun and clouds. The next best chance of much needed rainfall will be on Monday of next week. The milder trend continues this week, peaking on Saturday with highs in the mid 60s. Today’s sunshine will warm us to five degrees above average. The gap from average to actual widens to fifteen above average by Friday. The forecast highs for Saturday are already sitting in record territory at some climate stations. Sunday will be just as warm. These numbers could go higher, closer to the weekend. As of today, weekend highs are 18° above average. Late next week (December 15-18th) is the first time the Arctic air makes a dip into the Northeast this month. That will start the trend to the forecast more active second half of December. Is this December or October? So far, this December has been 6.3° above average. That trend will continue into this weekend. Gradual warming begins tomorrow with a cloudy morning, then a sunny afternoon. As record highs will be broken on Saturday, Sunday and Monday at the airports when highs reach the mid 60s, the warmth continues into the middle of next week. Additionally, Monday’s warmth will have a bit of a humidity component to it as well. The next chance for rain is on Monday. Cooler weather arrives again by Friday of next week, but that will only bring temperatures back to average. The really cold, typical December weather won’t be in place until the end of the month, at least. 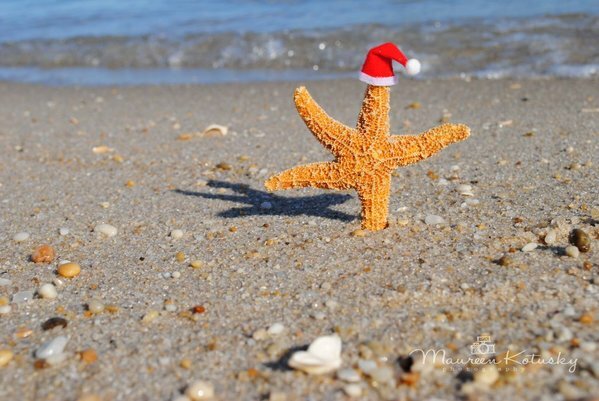 The chances of a White Christmas are very low. for this weekend, including Monday’s very warm weather. Forecast is in white. scenario to the northeast with more frequent rain events, but snow is unlikely. tomorrow. Despite clouds on Sunday, temperatures should warm to the mid 60s. After all the warm, and sunny weather yesterday, today will feel a bit cooler with clouds and fog. Some records will still fall, however. Steady rain rolls in after 6pm tonight, and ends with a brief thunderstorm after midnight. Tomorrow morning begins sunny with highs in the low 60s. The rest of the week slowly cools down before this upcoming weekend’s sharp chill. We’ll reach freezing for the first time this month on Friday and Saturday night, just in time for Winter on Monday night. Temperatures bounce back next week for another warmer than average couple of days. So far we have had above average temperatures for the month of December with record breaking temperatures averaging 15 to 20 degrees above average for the weekend. Changes are in the forecast for this week as low pressure moves out of the plains and heads northeast over the next 48 hours. 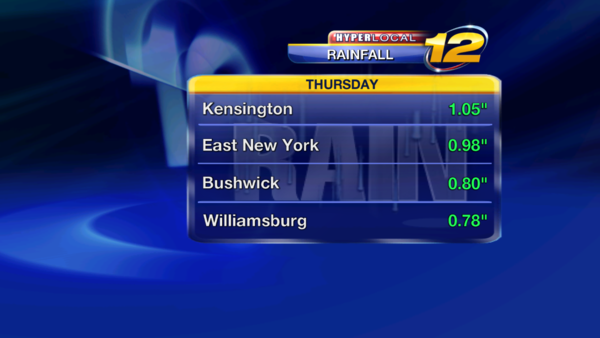 This low will bring a chance of much needed rain to the borough tonight. Rainfall amounts are forecasted to average around .25” during the late overnight hours. A clearing sky, gusty winds and cool temperatures are in the forecast for Tuesday. Get ready for a gradual cool down this week with highs in the 40s by the weekend. There is a 1-3% chance of a White Christmas. The gusty winds that peaked to 34 mph at Central Park and 37 mph for LaGuardia and JKF will relax tonight under a mostly clear sky. 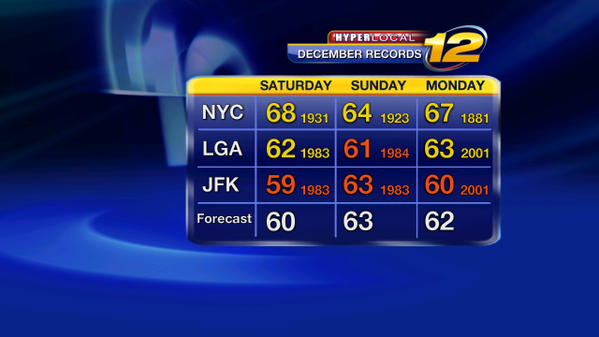 We also has record breaking temperatures at Central Park of 68 degrees and 64 degrees at JFK. High pressure will dominate for tonight with increasing clouds for Wednesday. Low pressure will move in from the southwest bringing us another round of much needed rain for Thursday. Today’s rain will drop about an inch of water across the borough. If it were snow, that would give a fresh 3-4 inches of heavy wet snow, or 10 inches of light fluffy snow. Since there’s no snow-making cold air in the forecast, we remain simply wet today, as well as for next week’s rain that arrives before Christmas. Once this afternoon’s heaviest of the rain ends, sunshine returns tomorrow with wind and cold in the forecast for Saturday. Wind chills will be in the 30s all day Saturday. Monday and Tuesday turns milder again with steady rain arriving Wednesday. Santa can affix the waterski attachments to his sled—up to 2 inches of rain falls next week with a 1-2 punch system of rain running through Christmas Eve. Since December has average 12.4° above normal, you may wonder if Winter will ever come? Starting tomorrow, the wind chill of 19° at daybreak will finally signal a change in seasons. Gusts tomorrow night near 40 mph. Not exactly wind advisory criteria, but close. But does it last? No. Milder weather is back as soon as Monday. Record highs are still likely on Christmas Eve and Day; however there is quite a bit of rain forecast for all next week starting Tuesday. Like last week, a cold front will move across the plains bringing us a slight chance of rain tonight through Tuesday and a better chance of rain Wednesday through early Thursday morning. Other than a scattered shower or drizzle through the evening and the overnight, we will have to deal with patchy areas of potentially dense for and overnight lows in the 50s. Another round of rain that may be heavy at times is in the forecast for Wednesday and Wednesday Night. A southwesterly flow will also continue to bring warmer than average temperatures to the boroughs for Christmas week. be in the 20s for tomorrow morning with briefly heavy rain until noon. clouds for the remainder of the day. average. The weekend is cooler. freezing most of the day. The rest of next week is milder and dry. Today’s weather will start cloudy and stay cloudy all day. Winds will be light, and temperatures stay cool, but just above average. Rain arrives tonight as light and spotty showers return for a few hours after dusk. 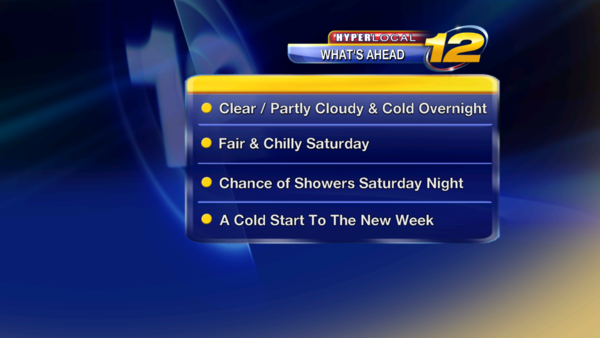 The rain ends after midnight and skies clear by dawn bringing a full day of sunny, milder weather to end the year. Highs tomorrow reach 12° above average. Tomorrow night will remain clear, but turn cooler. Ball drop weather is breezy and chilly. Midnight temp: 39° Wind chill around 30°. Heading into midtown? The wind will be blowing directly across the street grid, from the Hudson to the East River (from West to East). Temperatures keep dropping into the weekend. The coldest weather will be on Monday morning, when the day begins in the 20s. Milder weather arrives Tuesday and Wednesday. It’s the warmest we’ll get before another cold snap next weekend. Clouds, showers and fog are in the forecast through the overnight and into Thursday. Gradual clearing will take place during the day and a northwesterly winds will keep our temperatures cooler, but still above average for the end of December. 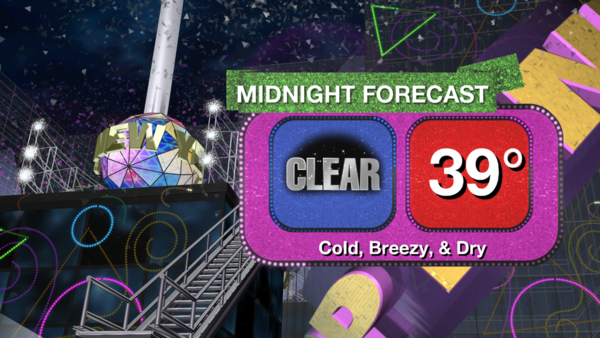 New Year’s Eve Forecast: Mostly clear, breezy and cold by the midnight hour with temperatures either side of 40s degrees. with the bitter cold late Monday. This morning already feels like the low 20s with wind. Tomorrow’s feels-like temperature will be 2 (not a typo). 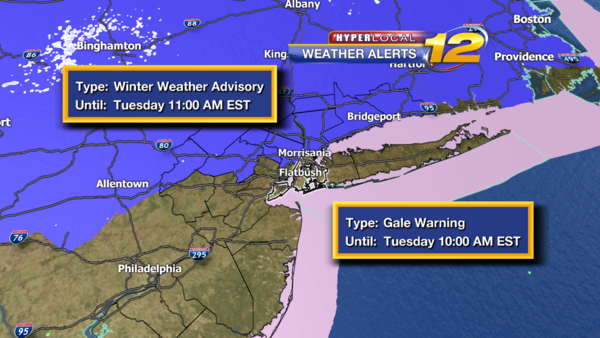 Winds pick up today, gusting to 35 mph, while a few flurries could fall this afternoon. This afternoon will feel like the teens. Seasonably chilly weather returns by Wednesday—our next day above the freezing point. Sunshine remains through Thursday, with increasing clouds and temperatures by Friday. Plan on plain rain Saturday and Sunday. High pressure over the northern Great Lakes region will continue to bring a blast of bitterly cold air to the borough tonight through Tuesday. Temperatures will moderate by mid-week as our wind profile comes from a west to southwesterly direction. The next best chance of rain will not be until Friday and or Saturday. 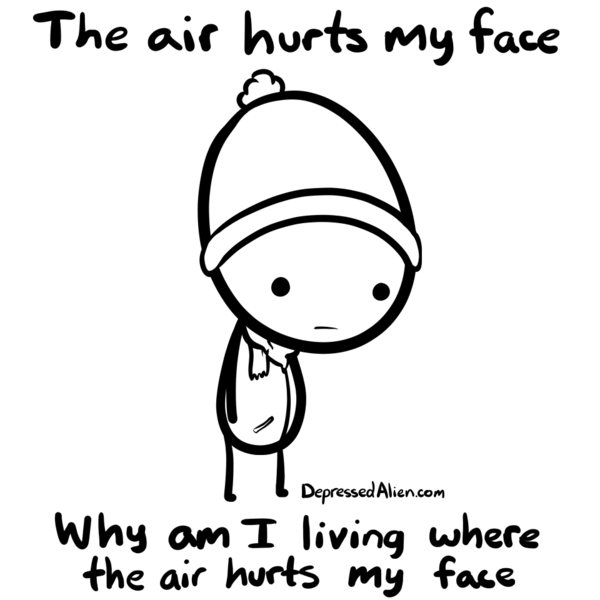 Today’s ridiculous cold is not the Polar Vortex. While the Circumpolar Vortex (actual name) is stronger than usual this year, today’s cold isn’t related. This is proof why it’s colder this morning in NYC (11°) than Anchorage (30°), Barrow (16°) and Fairbanks (14°), Alaska. Wind chills made it feel like -6° or -3° at dawn. Today’s highs will feel like 20° at best. Sunshine all day leads to a clear sky tonight, dropping actual air temps back into the teens. Tomorrow afternoon will be our first time back above the freezing mark since late Sunday night. Weekend rain arrives as soon as Friday evening, with on/off showers through Sunday as milder weather brings highs to 12-15° above average all weekend. Prolonged cold returns next Tuesday. 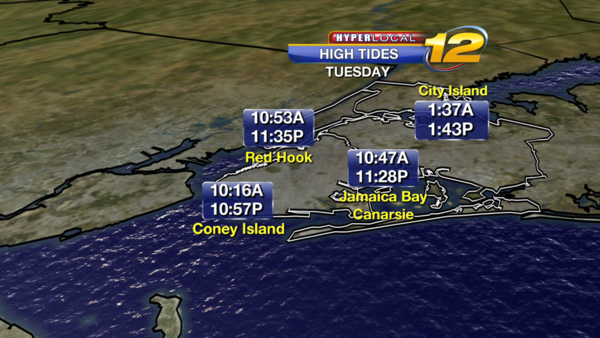 Tuesday was another very cold day for the boroughs with temperatures 11 to 13 degrees below average. Sunshine and lighter winds made it feel a bit more comfortable than Monday. We’ll have another very cold night with temperatures falling to the 20s. The high pressure system that brought the bitterly cold temperatures will drift south over the next 24 hours which will bring a warming trend to the region that will last through the weekend. that lasts into next weekend. Mostly clear and cold for tonight as high pressure dominants the region. The high has begun to draw a milder air flow from the southwest that will gradually increase our temperatures through the weekend. The warmer temperatures will be accompanied by periods of rain that may be heavy at times Sunday. Another round of cold weather returns next week.